At times underground house may as well be called ‘Pastel House’ with its uninspiring and insipid tones. Where as in the commercial world ‘Glossy House’ as we like to call it, is mostly generic and cliched. A state of affairs that thankfully DJ Seinfeld seems to be subverting with considerable ease. To illustrate our point listen to his Rimbaudian alias and the killer Drop It On Em or check last years Konets Sveta Minimix. And now he’s back with his third record of the year DJ Seinfeld – Airing of Grievances via E-Beamz. As you would expect from a DJ Seinfeld record the beats have a sense of rawness and breathless enthusiasm to them. Nothing feels overly scripted or detailed to death, as drums and percussion skip along with the playfulness and freedom of a child without a care in the world. Whilst the potent garage bassline and rave like piano have the authority and presence of an individual who knows exactly what they’re doing. Yet as good as ‘Airing of Grievances’ is, it might just be the B-Side ‘M44K – Mystvib‘ that’ll have you going weak at the knees? According to the Phonica blurb M44K – Mystvib is one of those ‘ID Please’ type tracks that everyone greatly desires, but no one appears to own. Well the wait is over, you can now dry those Eminem sweaty like palms. A French Touch like bassline, summery vocal, Will Smith type clap claps all combine to create a totally irresistible House banger. Expect heavy rotation this summer. 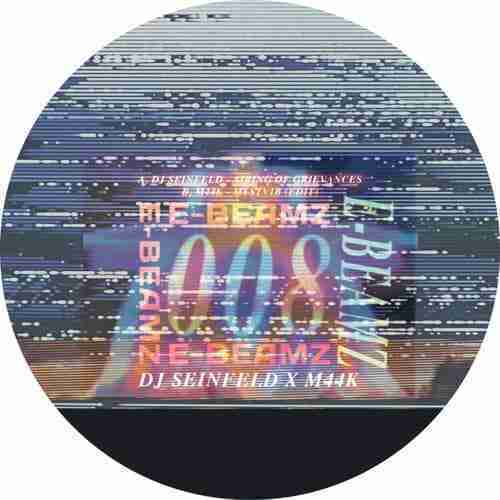 DJ Seinfeld & M44K is an EP from an artist who is clearly enjoying his music right now. Nothing feels cliched, pretentious or remotely calculating. The music is just what it is, and all the better for it. More please.